Have you been looking for a way to add aesthetic appeal and functionality to your new deck? What about a pergola? A pergola is an architectural structure that creates a shaded sitting area using cross-beams and a sturdy open lattice supported by vertical posts or pillars. Want shade? Why spring for a tacky awning when you could instead add a stylish pergola? Pergolas are aesthetically appealing, giving your landscape an eye-catching focal point unsurpassed by other structures. Pergolas add an element of privacy to your deck in a very stylish way. Add some climbing plants, and a pergola will help add some color to your otherwise monochromatic deck. Adding a pergola to a new deck will boost the value of your home. Best of all, pergolas are fairly simple and inexpensive to build. 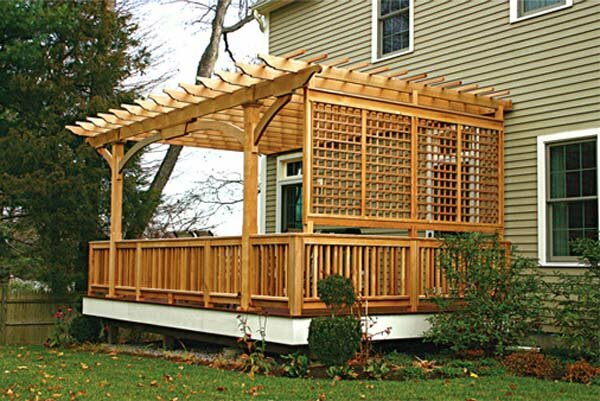 Adding a pergola to a new deck is a project that can be accomplished by most handy homeowners. However, it is not a DIY project that just anyone can accomplish. Install four deck post anchors into your deck using deck wood screws. Stand 4X4 timbers inside the deck post anchors and screw them into the anchors. Add crossbeams to the 4×4 timbers. Attach 2X4 inch boards over the cross beams, spacing them evenly, to form five rafters. Attach the rafters to the beams using hurricane clips and wood screws. Of course, the easiest way of adding a pergola to a new deck is to trust the professional deck builders at Freedom Fence & Home. This entry was posted on Wednesday, March 13th, 2013	at 5:32 pm	. Both comments and pings are currently closed.